Almost thirteen years ago, I opened my woodturning studio to turn production bowls. Very early on in my turning career, I also became interested in turning hollow forms. Like so many other turners back in the day, I learned how to do this by using an arm-brace tool utilising traditional blind hollowing techniques. the boring bars are inserted into a brace that you mount on your arm, hollowing for extended periods could be very fatiguing. Thankfully, learning to turn hollow forms today is an easy process, especially when using the Lyle Jamieson Tool System for hollow forms. This boring bar system eliminates uncomfortable turning positions altogether as you stand comfortably upright whilst hollowing. In addition, since the boring bar is fitted into a 'D' shaped receiver handle that is captured in a secondary backrest, the considerable rotational forces generated during hollowing are absorbed by the lathe and the tool rests, not your body! Lyle's system offers an optional laser guide that tells you exactly where your cutting tip is located inside of the closed form. The laser projects a red 'dot' on the exterior surface of the turning, so you can accurately determine where you are cutting and how much further you need to go to reach your desired wall thickness, or shape. It is now possible to hollow very complex shapes with exceptional ease and confidence using this laser-guided system. The laser can also be set up to work with pre-drawn templates, mounted on a small raised platform above the hollow form. The secondary backrest supports and stabilises the handle during use and is adjustable to fit many lathes. 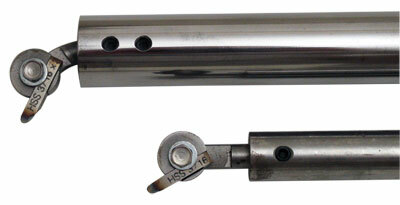 If you wish to turn deeper forms, an optional heavy-duty 30mm (1 1/8in) diameter bar is available. 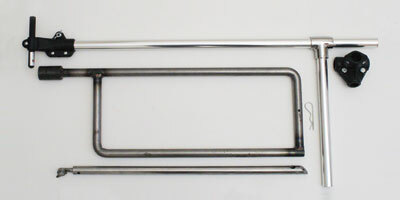 This boring bar system utilises a 'D' style receiver handle and double ended 20mm (3/4in) boring bar with a 5mm (3/16in) swivel tip cutter assembly. One end of the boring bar has been machined to allow the cutter head assembly to be inserted straight into the end of the bar, and the opposite end of the bar is angled at 45 degrees for reaching under the shoulder area on your vessel. An optional bent swivel assembly is also available for increased access under the shoulder area on vessels. I tested this system with several different green timbers including Mesquite (Prosopis juliflora), White Ash (Fraxinus americana), Sycamore (Platanaceae), Pecan (Carya illinoiensis) and Spalted Pear (Pyrus communis). One of the first things I noticed is how easy it is to setup and use. Even when using the laser guide, set up requires only a minute or two. During hollowing, the tool is extremely easy to control and manipulate inside the form. The 5mm (3/16in) swivel tip cutter assembly offers excellent control of the cutting angle at all times. Compared to my old arm-brace style hollower, this system was much less fatiguing to use over a full day of hollowing. I also tested this system on numerous dried and roughed out deep vase forms. Even though all of the vases had warped considerably, it was very easy to remove the warp inside the vase and finish turning the piece. It would have been a much more challenging experience to remove the warp on these pieces with my arm-brace tool, especially when reaching deep inside the form. The Lyle Jamieson Boring Bar System has transformed hollow form turning into a simple, fun and effortless activity! Even beginner woodturners can quickly master the art of hollow form turning using this system. If you are just getting into turning hollow forms or you have been at it for years, this well designed and easy to use hollowing system provides exceptional control of the hollowing process. There are also several different combination packages of this hollowing system on offer. 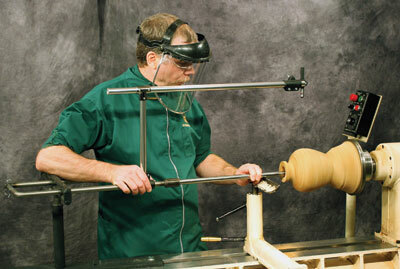 "Even beginner woodturners can quickly master the art of hollow form turning using this system"